A previous three-part series on RADIO-TIMETRAVELLER delved into Field Strength Calculations. It covered ground conductivity's effects on signal strength, measurements quantifying signal intensity, and how to use the FCC Groundwave Conductivity Graphs to calculate expected received signal strength. Mathematical formulas, somewhere, produced those graphs. What is their history? Might we use a simplified formula to calculate expected received signal strength for our DX purposes? Let's continue with the story behind Field Strength Calculations and explore the 50 year quest for accuracy in calculating signal strength by mathematical formula. It is an interesting tale. We will finish with a handy field strength calculator program I wrote using a simplified formula. When we talk about field strength, we are really talking about radio propagation - the behavior of radio waves when they are transmitted or propagated from one point on the earth to another, or into various parts of the atmosphere. In our formula quest, we will mostly be concerned with those signals that hug the ground, or "ground wave". It may surprise many who are new to the hobby of mediumwave DXing that daytime ground wave range for a mediumwave signal might extend out to as much as several hundred, and in extreme cases, nearly 1000 miles! Accurate formulas for calculating expected signal strength at mediumwave and longwave frequencies took many years to develop. Radio originally inhabited the longwaves in its infancy. Many of Marconi's early broadcasts, including his 1905-1906 transatlantic tests, were sub-100 KHz. The trend would be decidedly upward in frequency and downward in wavelength. At the end of World War I, a fierce battle ensued between the US government and the Department of the Navy over control of the airwaves. The Department of Commerce eventually won and became master of the air and the regulatory agency for commercial radio. They started by establishing two broadcast frequencies: 833 KHz (360 meters) and 619 KHz (485 meters). The Federal Radio Commission took charge in 1926, lasting until 1934 when the current Federal Communications Commission was formed. Throughout the early years of radio, interest mounted to quantitatively determine the service area of broadcast stations. Engineers redoubled their efforts to derive an accurate attenuation formula. 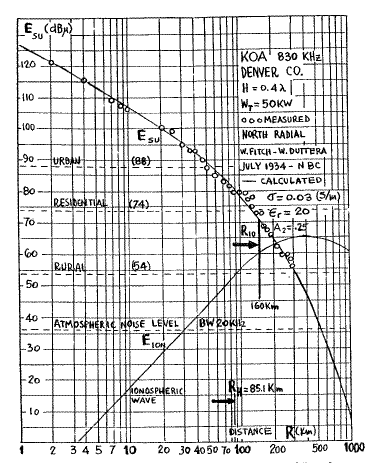 The radio world was focused on accuracy of measurements at broadcast frequencies. "Accuracy" is the key word here. The Inverse-Square Law, as applied to physics, had been commonly known since Isaac Newton's day in the 1600s. Applied to radio, it stated that the power density of the wave is proportional to the inverse of the square of the distance from a point source. In other words, doubling the distance from a transmitter means that the power density of the radiated wave at that new location is reduced to one-quarter of its previous value. But did it apply? "Free-space" formulas calculating signal loss in the vacuum of space or "perfectly conducting earth" using the so-called inverse-square law are indeed accurate for those environments. But the Earth is not a perfect conductor, nor does it represent perfect-world conditions. Free-space formulas alone are not usable for our purposes. You will find many of them on the web, even calculators, purporting to deliver a signal strength solution for a given transmitter-to-receiver distance. They can be ignored as inaccurate. In fact, they are not even close. Mathematicians started with a "plane earth" (flat earth) theory when they first envisioned a signal attenuation formula. Brilliant, German-born genius Arnold Sommerfeld, nominated a record 81 times for the Nobel Prize during his lifetime, solved the plane earth general problem by 1909, publishing signal attenuation graphs in 1911. Bruno Rolf, basing his work on Sommerfeld's findings, published more attenuation graphs in 1930, some 21 years later. From this information, the Federal Radio Commission compiled formulas and curves, published in 1931. They were used in hearings and allocation matters at least until 1933. It was just the beginning. In the intervening years from 1909 to 1930, four more scientists obtained independent solutions of the Sommerfeld problem which agreed with the 1909 solution. That is, except for one difference - an inverted mathematical sign. Apparently none of these authors noticed this discrepancy until the FCC's K.A. Norton, in a letter to the editor of "Nature" in 1935, pointed it out and showed that it was responsible for the anomalies in propagation predicted by the Sommerfeld-Rolf graphs. Norton in 1936 was able to construct a universal curve for prediction of field strength at relatively short distances. Focusing on the plane earth theory, Sommerfeld expected that the surface or ground wave would be only slightly affected by the curvature of the earth since it is guided around the earth's curve in much the same manner as an electric field can follow around the bend in a wire with a comparatively small loss of energy. This explains the general success of the Sommerfeld plane earth formula at distances far beyond the line of sight. However, two major roadblocks to accuracy still existed. The first, and most important, was "diffraction". The other, "intermediate distance". Out beyond what is called the "radio horizon", radio signals undergo atmospheric and ionospheric diffraction, that is, refraction and scattering caused by atmospheric irregularities. This enables AM radio signals in low-noise environments to be received well after the transmitting antenna has dropped below the horizon. It has been shown theoretically that the ground wave attenuation factor at mediumwave frequencies is very little affected by diffraction at distances less than about 55 miles, the approximate "radio horizon" for mediumwave. Norton, also in 1936, provided curves for greater distances in the diffraction region. These curves, however, were based on an incompletely developed theory. Mathematical solutions were being developed in Europe, and were two years away from completion. Europeans van der Pol and Bremmer published their paper in 1938, offering a more complete solution of the radio diffraction problem for propagation. Never-the-less, the calculation of field strength beyond the radio horizon still proved troublesome, though Norton's remarkable work clarified Sommerfeld's ground wave propagation theory. The radio horizon at the longer wavelengths, including mediumwave, can be calculated quite simply. For example, the radio horizon for a station transmitting on 600 KHz is about 59 miles. By 1940 the FCC, through the work of K. A. Norton, had developed a practical method for constructing curves approximately representing the theoretical predictions. The method used the flat earth theory of Sommerfeld out to a distance of about 80 kilometers, and the diffraction theory of van der Pol and Bremmer at relatively great distances, those in excess of 200-300 kilometers depending on frequency and ground constants. The gap in the curve was still intermediate distances. The Watson transformation, a theory originally described in 1918 by English mathematician G.N. Watson, was an attempt to connect the two. How to incorporate it into the general theory, to calculate the intermediate distances, was still the final problem. In the curves published in 1940, the gap was simply sketched in by a draftsman. In 1952, George A. Hufford of the National Telecommunications and Information Administration provided a basis for unifying the ground wave prediction methods of Sommerfeld with Watson's diffraction transformation. It had been 43 years since Sommerfeld's 1909 thesis. There was finally light at the end of the tunnel. New curves were added in 1954 for very low conductivity. These were quite accurate, although freehand drawing was still necessary to join the Sommerfeld curve segment to the curve segment calculated for the diffraction field at relatively great distances. Then in 1958, Hendricus Bremmer, the same Bremmer who in 1938 brought the general solution to the diffraction problem, provided correction terms which completed the search for the practical formula. Engineers could finally calculate ground wave field strength with accuracy. It had been 50 years in the making. The formula was born. The FCC curves were considered satisfactory for regulatory purposes until it became necessary to convert to metric units toward the end of the 1970s. In a 1979 FCC report, it was recommended that a computer program be written for recalculating the curves using the methods in Bremmer's 1949 book. The program was subsequently used to produce new FCC curves in 1985 which agree within 1 to 2 decibels with the previous curves. However, the 1979 computer program was mathematically deficient in its ability to cover all the range of intermediate distances, and the great distance values it computed were shifted upward to force a match in the middle. FCC curves drawn for the X-band, 1605-1705 KHz, are the most recent. They are the result of precise calculations of field strength over the full range of distances of interest, including the previously troublesome intermediate distances. And thus we have the short version of the history to achieve accuracy in field strength formulas. Stay tuned for the next installment, a program to calculate field strength, based on a simplified formula.